What did I plan to purchase? I care about taking care of skin, and the French really set the bar for the quality with which people should be treating their skin. French skincare is part of the charm of the chic French woman, whose skin is so good that she is able to spend minimal time on her makeup routine and, instead, go for that je ne sais quoi look. The number one spot recommended to me? CityPharma. I knew that all French pharmacies would carry a much wider range of French skincare products than American drugstores do, but CityPharma is the spot to get great deals on excellent products. Confession? I was really scared to go here. I read a few testimonies online that the store would be overrun by tourists, a chaotic war scene where shelves would get cleared out before my eyes if I didn’t gird my loins and fight my way through. Reality? It was so calm and quiet and orderly. I’ll be really honest with you: I’ve never seen a place with so many Asian tourists carrying so much merchandise to bring home be so quiet and orderly, real talk. There were so many staff members answering questions, not rushing people, taking time to explain what products are best for what skin, not pushing to try to make a commission because it’s a pharmacy and not that kind of retailer. Honestly, this was still the most stunning thing about this place, even more stunning to me than the prices. Anyway, without further ado, here are the products that I panicked and threw into my basket. I didn’t want to come away with so much, and definitely didn’t think I would quality for a VAT refund (more on that later), but Ben was enabling me once he learned what the discount was compared to back in the States. Tip: Go to the checkout area for a basket, since all the baskets wind up there and NOT at the little basket area near the entrance. You will need a basket. Don’t fool yourself. Don’t fool yourself into thinking you’ll just be casually walking around this store with an armful of products. HAIR // I had been meaning to try the Klorane Dry Shampoo with Oat Milk for a while, so when I saw this 2-pack for less than one bottle would cost back home, I snatched it up. I don’t exactly need more dry shampoo (I have a dry shampoo round-up coming at you soon though!) but it doesn’t go bad and I will need it eventually. Also, since I have colored hair and was already in the Klorane section, I picked up the Klorane Color-Safe Shampoo + Conditioner + Leave-In Cream with Pomegranate to round out my hair-care routine. I don’t love these, as I find my hair doesn’t feel as clean when I rinse them out as with my other color-safe stuff, but my color has been holding on. The Caudalie Beauty Elixir is something I already have a sample of from the location in DC and enjoy using, and may be the product that led to me having so many face sprays in my arsenal now. The Caudalie Grape Water was a special deal because it’s a limited edition bottle? (I don’t believe the usual bottle design is that fuschia color.) So I wound up with a few of those to give as gifts. And the Avène Thermal Spring Water has such clout that I found it necessary to buy travel-sized and full-sized bottles of it. This is just who I am now, apparently. I just have to get over the perceived weirdness of spraying my face around other people because it’s winter and my face is dry, folks! POCKET-SIZED PRODUCTS // As I was leaving, there were these little shelves of products that were bundled for easy gifting and just to get you to buy more products, to be honest, because as I later looked they weren’t buy-one get-one free, more like buy-one get-one 50% sometimes. I got a Nuxe Lip Balm Stick, which is apparently not as good as the potted lip balm and I can see how, and the Caudalie Hand Cream, which smells kind of strange and has a texture I don’t love. All in all, we had a really positive experience at CityPharma and will definitely go back to load up on French skincare for ourselves and for others. What are your favorite French pharmacy products? I love Caudalie as a brand and am glad I have great access to them because they have one of their spa locations in DC. I do like the Klorane dry shampoo, so I have to explore their other products. Where do you like to shop in Paris? But then I remember that literally everyone has skin, it’s not a gendered organ, whatever. I have been interested in Tatcha as a brand for a little while. (The branding works on me: I want to unlock geisha beauty secrets!) Every time they offer a value set at Sephora, I have a look, but I usually can’t justify the purchase for such little samples of product. I found this set at TJ Maxx, actually, so I am looking forward to trying out the entire set. Can’t wait to unleash geisha beauty unto my face! So… I am a huge sucker for any value set, but I am especially weak for the Sephora Favorites value sets. (One of the single biggest purchases I ever made at Sephora was their Super Stars set a few Black Fridays ago.) There have been a lot of great ones in the past few months, and I chose this one because it’s a dedicated skincare set that covers a wide variety of functions. (Some of the sets are masks only, moisturizers only, etc. I also haven’t been as excited about the makeup sets because I’m usually most interested in the concealer/tinted moisturizer but the only shade offered in the set is too dark for me.) I originally purchased this set a gift, and then circled around the store and grabbed another one for myself. Sometimes you just have to treat yo face. There are a lot of different types of products in here, including some will be very new to me like glycolic acid pads and the eyelash enhancer, so I’m excited to try this set out! I also have my free Sephora birthday gift to try out. This year, they had the option of a makeup gift from Marc Jacobs, but I chose the skincare gift from Fresh, which included a small soy cleanser and a rose face mask. Christine, being the darling gem that she is, sent me a package on my birthday! (And it arrived on the day of my birthday, great timing!) In it, she included a card that made me cry alongside 3 of her favorite beauty products. I’ve actually been waiting to try out the Skinfood mask after I finish up the last of the black sugar mask I have now, and I am really excited to try out these Misscha products because I have actually never used an essence or an ampoule in my skincare routine before! As much as I read about skincare, I am actually not a strict adherent to the many steps of the Korean skin regimen and often get very lazy. I will be traveling over the holidays, so I’m sure my skin will really appreciate some extra love and care when I get back. These products will be great for kicking off the new year by treating my body’s largest organ a little extra nice! Happy holidays, however you are celebrating! I am very excited that Chankuah begins on Christmas Eve (great for the Christmukkah celebrants!) and ends on New Year’s Eve this year; it makes the holiday season extra special. Do you have any skincare recommendations for me? My absolute minimum recommendations to everyone is to use a moisturizer every evening and a light SPF every morning. I may have nagged a male coworker of mine the other day, but I think he knows I push sunscreen on everyone out of care! However, we spent all of Black Friday showing someone around New York, and people ditched us after dinner anyway, so around 8 PM we headed out to Best Buy, figuring that it wouldn’t be too hectic after 2 hours of being open. SD card – When I lost my camera, I lost my 8 GB SD card for my camera, and now I only have my 2 GB one. I like having more on hand, preferably in a larger file size. A 2 TB portable external hard drive – I didn’t plan on getting such a large size and I didn’t think that portability was so important, but my dad convinced me since it’s more convenient to be able to carry it around AND if I keep up at the rate that I’m currently going with my photos and videos, then I’ll need the large storage capacity. A wireless mouse – I gave my old one to my brother and then he broke it. So. I don’t use them much but if I need one, I’ll have one. Headphones & earbuds – For my listening needs, since my old ones are on their last legs now. I got the warranty for the headphones but I’m tired of getting them for these Skullcandy earbuds… sigh. Because of that external hard drive, I ended up spending the most money at Best Buy this weekend. No sales tax on clothing holla at me! Black button-down blouse, aubergine button-up cardgian, & red lace-trimmed tank – Just picking up some basics from Old Navy; no real rhyme or reason here but I’m sure I’ll wear these plenty. 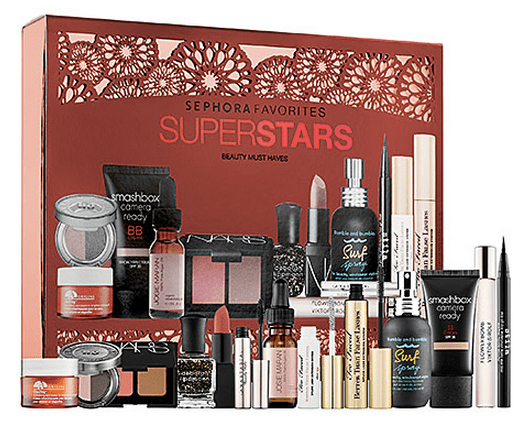 The Sephora Favorites Super Stars Beauty Essentials gift set (no longer available on their website). I saw this at Sephora a few weeks ago and haven’t been able to stop thinking about it. It’s $75, which is more than I like spending on anything, let alone on beauty supplies since I, uh… don’t really wear makeup. Ever. ^^;; I have a bit more knowledge than would appear, since I watch a lot of Youtube beauty gurus and read a lot of magazines. In fact, I will be adding to my resolutions that I will not be purchasing any other makeup/beauty products unless something goes empty that I need (e.g. my moisturizer, etc.). Because honestly, I won’t need anything ever again. Ever. Never for never. 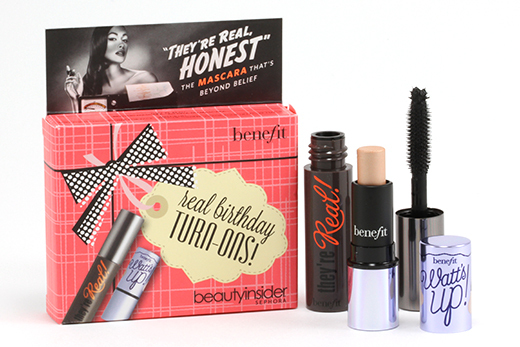 I also got my Beauty Insider birthday gift! That was a surprise, since my birthday is in December, but I guess they have us all ready, so I got Benefit’s They’re Real! mascara & Watt’s Up highlighter earlier than I thought I would, so yay. That is my little haul from the weekend! My Thanksgiving in and of itself wasn’t terribly eventful. We ate dinner with my family and some of their friends and spent time freezing in New York (I may go into that day in a later post).